‘I cannot go out in the sun. Whenever I go outside, I get a burning sensation in my skin. My skin peels off and, at times, there is bleeding,’ says a 13-year-old girl who has become a pariah in her neighbourhood and school in Indore, India, with some cruelly calling her the “snake girl”. Vedika Gupta, a Grade VII student, suffers from ichthyosis, a genetic disorder that causes her skin to become scaly and flake off. The condition that affects one in 2,00,000 people, has confined Vedika to her room and forced her to lead a life of isolation. Like other girls of her age, Vedika cannot go out and play. “All I can do is watch children my age play and enjoy their life. I often ask myself as to why I have been subjected to this kind of punishment by the god. What sin have I committed to suffer like this,” says the girl who spends her time studying, painting and watching tv as she doesn’t have any playmates in the neighbourhood in Indore, Madhya Pradesh. Vedika’s family has seen several doctors but none of them have been able to provide a cure for it. In the absence of any prescribed medicine or treatment plan, Vedika is left with no option but to resort to applying generic body lotion to keep her skin moist and stop it from flaking off. She has to apply the lotion multiple times in a day — after taking a shower or washing her hands and feet — in order to prevent the skin getting dried and bleed. The Guptas have seen doctors in advanced facilities in Mumbai and Delhi, but none of them could offer a cure either. Thinking modern treatment doesn’t seem to have a cure for this disease, they started homeopathic medication . But that too didn’t help. Instead, it aggravated the condition. It became so bad that she would have constant itching and occasional bleeding from the skin cracks. The dry skin creates tension in the face, making their eyes red and stretched. “My eye keep welling up and shed tears just like that. If there is any treatment that helps improve my skin condition by 50%, it will give my confidence a boost,” said the 13-year-old gritty girl. "We had given up hope, it was then we learnt about the story of Shalini Yadav who suffered from the same disease as our daughter. That she was taken to Spain and treated by doctors there. We have been told that the doctors have shared the formula of the medicines with an Indian Pharma company. That the medicine will be available in India, too,” said the 45-year-old mother. The doctors in Spain who had treated Shalini have now volunteered to share the medicine’s formula which would help Vedika get her treatment in India itself and they do not have to go abroad for their treatment. Vedika's treatment costs around 15000 Rs per month and she would require it for atleast 5 years in order to show some signs of improvement and hopeful recovery. Your contribution will go directly towards funding the medication for Vedika. Thank you so much for all the support you have shown towards Vedika so far. 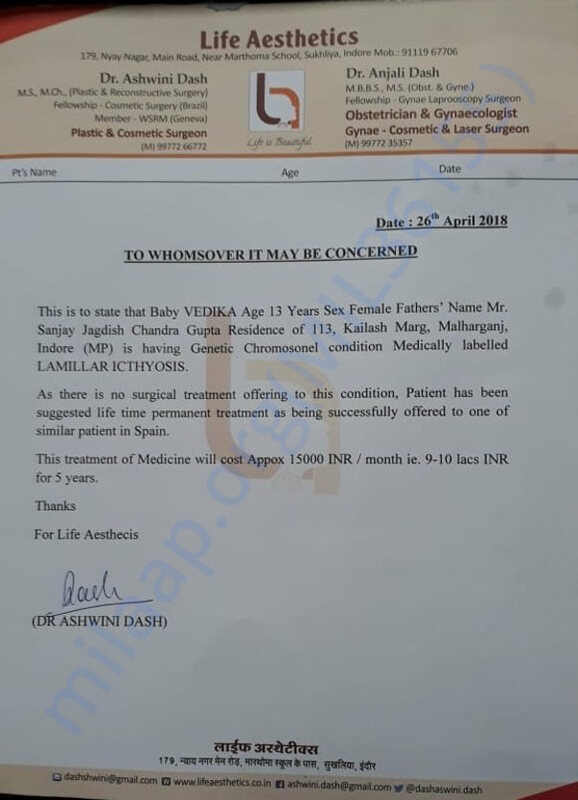 Vedika's condition is still the same but I am glad to inform you that an Indian pharma company that had agreed to make medicine for the girl with snake-skin disease, is ready with the first batch. The pharma company is ready with the first batch of five. The funds raised from this campaign will be utilised to purchase this medicine so that Vedika can get the treatment at the earliest. We will keep you posted on her condition and improvement. Once again thank you for the support you have shown. Vedika is doing okay and is at home currently. Her father has gone to Maharashtra to bring her some ayurvedic medicines for now. We have gotten in touch with a pharmaceutical company in Chennai and we discussed the possible solutions for Vedika's condition. They have agreed to manufacture medicines for which the formula will be prepared in Spain. For now, there is no particular treatment but she needs to improve her lifestyle. We are all hopeful about her recovery. Please keep praying for her. Thank you again! Don't care about the world, just live your life. My best wishes with you.